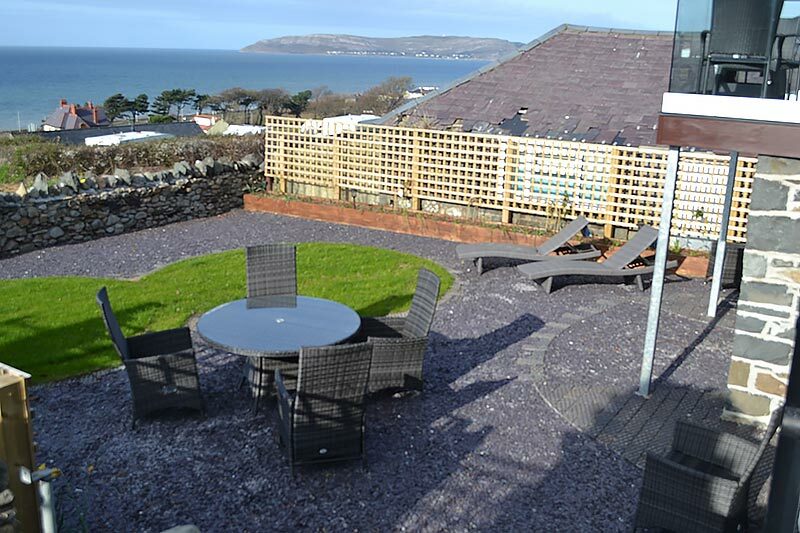 Cae Cyd holiday cottage is a stunning barn conversion commanding superb views over Conwy Bay to Anglesey and the Great Orme at Llandudno. This two bedroom cottage sleeps 4 adults, and has a balcony from which you can make the most of the stunning sea views. 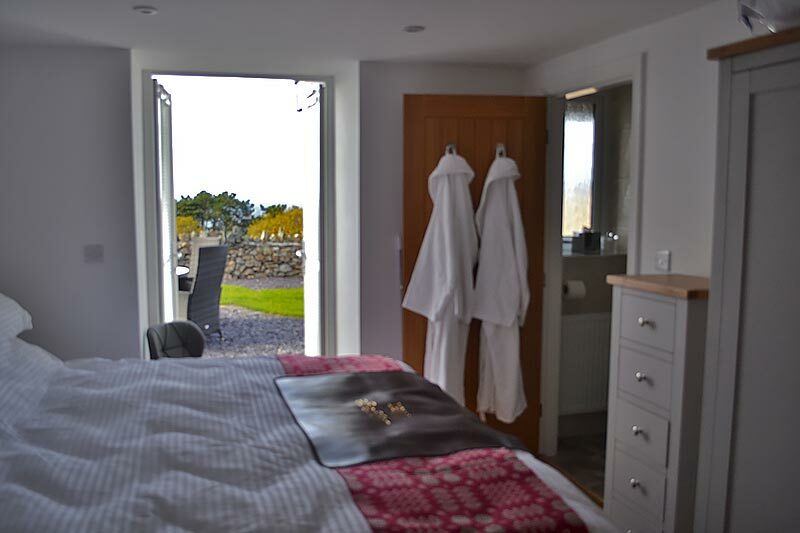 This two bedroom cottage sleeps 4 adults, with 2 bedrooms, both of which are en suite. The Super King bedroom (which can be converted to twin beds) has an en suite shower room, and the second bedroom a King size bed with en suite bathroom with over bath shower. Both bedrooms are on the ground floor and have patio doors onto a private patio equipped with table and chairs and sun loungers and electric BBQ, a lovely area to enjoy the views. Also downstairs is a fully equipped utility room with washer and dryer and there is also a downstairs toilet. 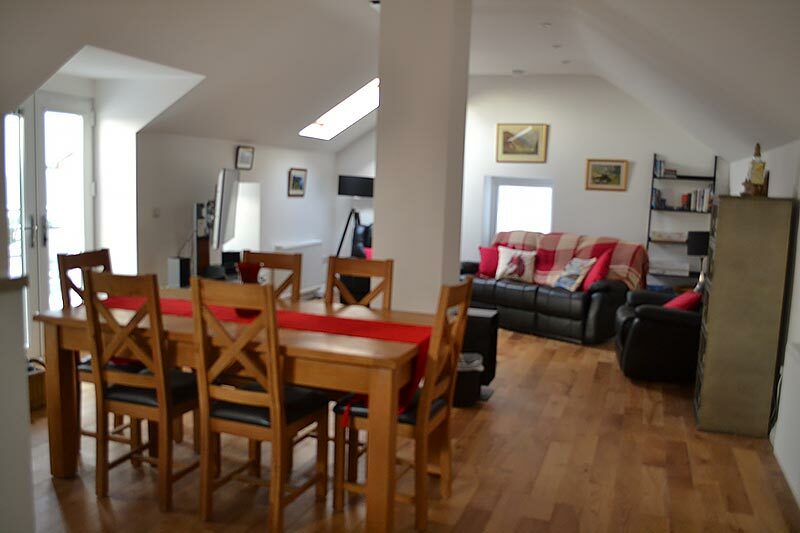 Upstairs Cae Cyd is open plan, the kitchen has electric oven, gas hob, microwave and dishwasher, a dining room with balcony access and a lounge with leather recliners, smart TV, CD player, DVD player and free internet. Cae Cyd has Gas central heating and a log burner in the lounge. We regret we cannot accept pets. Smoking is not allowed in the cottage. There is private parking for 2 vehicles by the cottage. To request or conform a booking please fill in our online holiday cottage enquiry form. Short breaks are available where Y is shown in table, minimum stay of 3 nights. Reservations may be made by e mail using the online enquiry form or by telephone. To secure the booking a £200 deposit is required, payable by card. A booking is deemed provisional until the deposit is received. Once the deposit is received a booking confirmation will be issued indicating the balance payable and the date it is due, along with a booking form which must be returned to us as soon as possible. The balance is due 6 weeks prior to arrival. Bookings made within six weeks of the arrival date are payable in full. 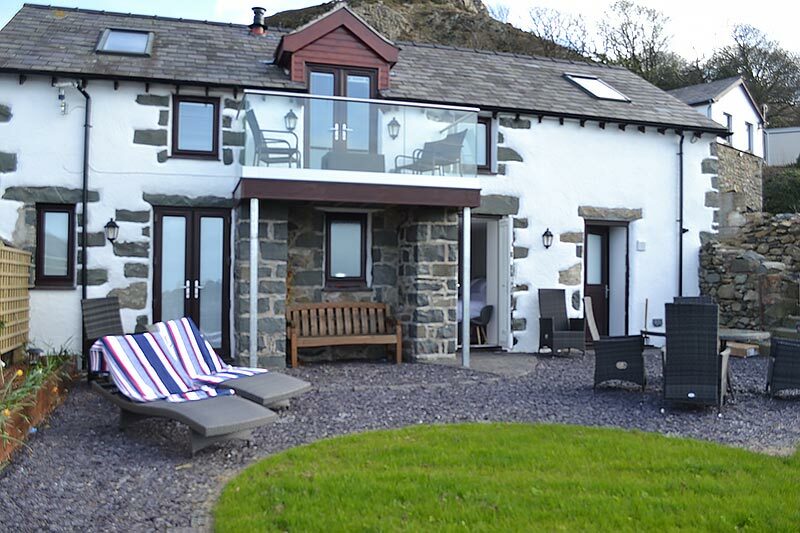 We reserve the right to re-let the cottage if full payment is not received by the due date. Please note on payment of balance a £200 security deposit will be pre authorized on your card. This will be released in full after a post departure inspection usually within 5 working days. If for any reason beyond our control the cottage is not available on the dates booked, all monies will be refunded in full. This will be the full extent of our liability. We strongly suggest you take out Holiday insurance to cover your holiday. The rate is fully inclusive of electricity, central heating, hot water, towels and bed linen and all the “little extras” we provide. Cae Cyd is available from 3pm on day of arrival. We ask that it is vacated by 10.30 on the morning of departure. Cae Cyd can only accommodate 4 adults, please note we do not accept stag or hen parties. There is a strict no smoking policy to comply with our legal obligations. Regrettably, anyone found to be smoking indoors will be liable to a cleaning charge of up to £250. If smoking outside on the patio, cigarette ends must disposed of in the sand buckets provided. We ask that guests report any breakages or damage as soon as possible. All breakages or damage must be paid for. Guests must agree to let us have reasonable access to the cottage or patio if necessary. There is a private off road parking area for guests at Cae Cyd, but car and contents are parked at owners risk. Cae Cyd must be left clean and tidy on day of departure.